Dynasolve CU-6 Urethane Cleaning Solvent is a non-gelling, higher flash point version of Dynasolve CU-5 Urethane Cleaning Solvent. Especially recommended in applications in which liquid isocyanates are present either prior to cleaning or will be introduced after cleaning (such as in a mixing tank). Dynasolve CU-6 Urethane Cleaning Solvent is non-chlorinated, non-flammable (by U.S.Department of Transportation definition), non-carcinogenic, and non-ozone depleting. It replaces and improves on the performance of commodity solvents such as methylene chloride, acetone, methyl ethyl ketone (MEK), and1,1,1-trichloroethane. Dynasolve CU-6 Urethane Cleaning Solvent can be used for extended periods, tolerate high resin loadings, and will reduce disposal costs. It is also recyclable via vacuum distillation. build-up from mixing heads,troughs, conveyor parts, side walls, rollers, foam cutting devices and molds. 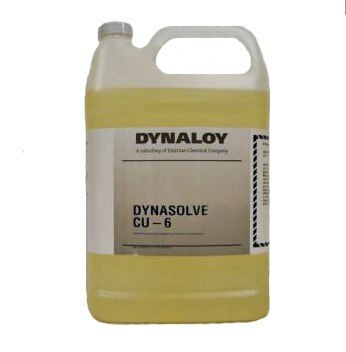 When heated, Dynasolve CU-6 will also clean many types of epoxies and other adhesives. All Dynasolve CU-6 documentation, manuals and resources available HERE.